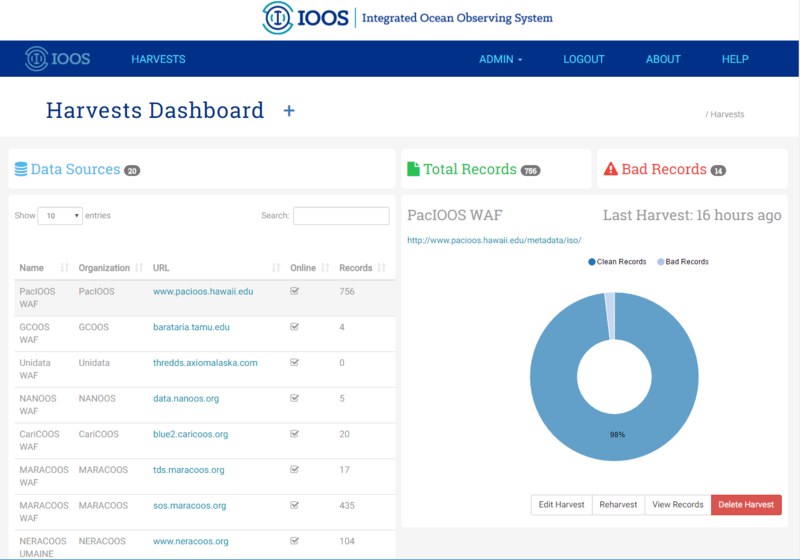 The Harvest Registry is the access point for adding or updating content in the IOOS Catalog. The Registry maintains a list of web-accessible folders (WAFs) and CS-W services from which the Catalog will harvest ISO 19115-2 compatible XML metadata records. The first step to using the Registry is to request an account, details on that can be found on the user accounts page. Once your account is approved and your IOOS organization affiliation confirmed, the next step is to configure the list of WAF and/or CS-W harvest sources that contain metadata describing your organization’s datasets. Detail on how to do this can be found on the managing harvests page. The Registry provides a high degree of control over managing, troubleshooting (including displaying ISO XML validation and CKAN harvesting errors), and previewing dataset metadata for publishing in the IOOS Catalog.